Good morning all of you amazing teachers out there! Today I have a post that I’ve literally been meaning to do forever now. I get so many questions on how I laminate, which laminator I use, and if I have any tips or tricks to save money when laminating. Plus there’s an amazing video and awesome giveaway at the end of this post, so make sure to read all the way through! So let’s start with the Q&A! 1. 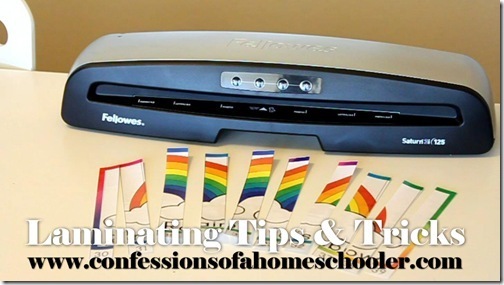 Do you laminate all of your preschool and K4/5 products? No. I only laminate that which I know that we will need to reuse later on. Laminating products makes them more durable so they last longer. I do recommend laminating my lacing cards simply because they might tear when your student is lacing the yarn, shoe laces, or string through the holes. Otherwise, you don’t really have to laminate the rest of the stuff if you don’t want to. 2. Do you print everything on cardstock? No. I used to print on cardstock, but I’ve found that regular ole’ copy paper does just fine when laminated. And the laminate gives it enough durability to work for our needs. Literally I just buy the least expensive kind I can find! 3. Do you cut apart all of your little pieces before laminating? Oh honey, ain’t nobody got time for that! I’ve got 4 kids, homeschool, and run a blog. Plus I’m lazy, so the thought of cutting tiny pieces, carefully arranging them on a laminating sheet, then re-cut them out after laminating is just too much! So I just laminate the entire sheet, then cut out my pieces. So far I’ve only had a few instances where the lamination pulled off of the paper after cutting them. However, if it makes sense and you can fit more pieces on your lamination by cutting first by all means go for it. 4. Do you have any tips to save money? Yes! Watch the video to find out my laminating secret to cut your laminating cost in half! Check out my Laminating Tips & Tricks video below! 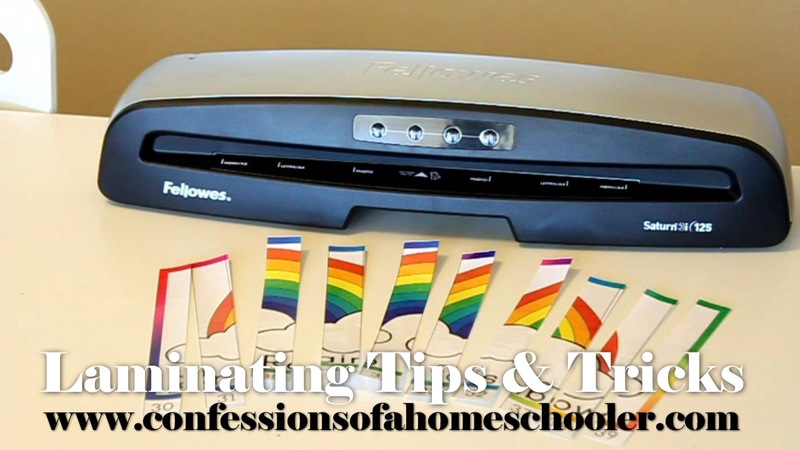 Do you have any laminating suggestions or tips that have worked for you? Make sure to stop in at my COAH Community and start a discussion! The model I used, and am giving away to one of you, is the Saturn 3i 125 Laminator. You can use it to create reusable documents for class rosters, worksheets, signs, and of course all of my super fun Letter of the Week preschool activities too! The Saturn 3i uses an InstaHeat Technology to increase productivity and features an Auto Shut Off feature just incase you forget to turn it off! Whew! No burning down the house if you know what I mean. The Fellows website also has a fun idea center that has lots of free projects and templates that you can download and use! And if you’d like to see more details about the Saturn 3i 125 Laminator you can check out this fun video too! Ready to enter? Just fill out the rafflecopter below to enter to win! Disclosure: Some of the links contained in this post may be affiliate links. That means that I may receive a small contribution if you purchase any items through links on my site. That said, all opinions given on my website are mine and were not influenced by any free product received or by the company that was kind enough to send me cool stuff to review. You mentioned that occasionally lamination will peel off cutouts. If they do, place them between two sheets of wax paper and iron them. The lamination adheres and you don’t have to do the piece again. If your laminated pages come out wrinkled or bubbly despite having the heat setting correct, next time, after putting your papers in the laminating pouch, place the whole thing inside a Manila file folder and run it through the laminator file folder and all. Your laminated page will be smooth and clear and you can store the file folder with your laminating sheets to be reused again and again.